When it comes to policing and security, double standards and unfair discrimination against minority groups always occurs, both here and internationally, generally fed by intolerance and irrational fears. "...we must fight them as they fight us, an eye for an eye and a tooth for a tooth." "I apologise that women had to witness this today, but in our land our women have to see the same. You people will never be safe, remove your governments, they don't care about you." I can envisage this incident causing widespread fears, tighter security and all dark skinned or Muslim men being regarded with even more suspicion. Few people, especially the police or Government will spend time addressing the causes or background to this incident. While the "eye for an eye and a tooth for a tooth" is a very archaic form of justice, for the US any terrorist related deaths generally involves retribution well beyond the original act. The Iraq war was seen by many Americans as a response to September 11, and this wasn't discouraged by the government. Almost 3,000 died from the Twin Towers attack and in comparison 110,000 Iraqi civilians lost their lives and their country has been left far more broken than the loss of two skyscrapers. The war in Afghanistan has resulted in around 10,000 civilians (a minimum estimate) being killed through US led foreign military action and around 100,000 people displaced before Osama Bin Laden was finally tracked down and executed. The US have gone even further than just retribution and have taken the approach of pre-empting possible terrorism by killing terrorists before they act. Currently President Obama is supporting drone attacks within other countries to kill "potential" terrorists, and often killing innocent people in the process. There have even been doubts regarding the evidence used to identify the individuals targeted. While the actions of the young man in the video seems particularly chilling, is it more acceptable to kill someone with an unmanned drone? While US citizens may be fearful of Islamic terrorists, Muslims, statistically, have far more reason to fear the US. Luckily we have had few incidents in New Zealand that could be called terrorist acts resulting in loss of life and the only one that really comes to mind is the bombing of the Rainbow Warrior. In that case it was a supposedly friendly nation that instigated it and our secret service was too busy spying on the likes of Keith Locke to be aware of the threat. Maori dominate our crime statistics, our prison populations and have much poorer health outcomes than Pakeha. They are also most likely to be unemployed, live on the lowest incomes, and live in substandard houses. Young Maori men are often regarded with suspicion and even law abiding, academically successful young Maori have stories of being stopped, questioned and even physically harassed by the police when going about their lawful business. Maori who are apprehended for criminal activity, no matter how minor, are more likely to receive treatment that is more severe than what Pakeha would receive for the same behaviour. The police response to the threat posed by Tame Iti and his mates has now been established as unlawful and unwarranted. The only terrorist activity in the end was committed by the police themselves and the trauma suffered by innocent children and families through the police actions is ongoing. A vague apology and no compensation has followed the report. As other commentators have mentioned, this would have never happened in Remuera. I wonder if both Muslims and Maori were treated in a more even handed and moderate way whether they would pose the same threats or feel the same need to act violently? "...the only one that really comes to mind is the bombing of the Rainbow Warrior." Actually your comparisons seem a bit off - the recent murder in London compares more with other hate crimes in Britain, mostly against Black people. The Urewera example is kind of hard to discuss in racial terms, as both Pakeha and Maori were involved, but commited no acts of violence. The two men in question are murdering barbarian thugs. They want us to believe there is a links between their actions and the UK government's actions. There is no link, they are just common murderers, though their method was particularly awful. Coincidentally, it suits the agendas of some governments to accept the claim that these men are terrorists. And on that basis I believe we have more to fear from those governments than we do from any real terrorists. Sam, I didn't include the Trades Hall bombing because although it could have been a terrorist action it is still supposition as the case was never solved. 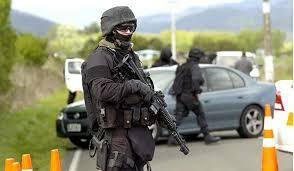 Terrorism is generally considered to involve an ongoing strategy by an organisation. You will have to explain what you mean by "hate crimes" so that I can understand your point regarding inappropriate comparisons. The Urewera raids did indeed involve individuals who were non Maori, but the community that was targeted was Maori and the justification was potential Maori terrorism. Armchair, I don't think that the two men were just "murdering barbarian thugs", it does not appear to be a gratuitous action done at the spur of the moment. There was an apology to women and political concerns were expressed. I don't believe that the killing would have occurred if there wasn't a perception that Muslims were being persecuted. I am not attempting to justify their actions, because there is no justification. None of that makes it terrorism, Dave. They're common criminals and deserve the full force of the law applied. I'd like to try to run an "innocent until proven guilty in a court of law" argument, but my liberal heart just can't. I think we are talking at cross purposes, Armchair, I never called the men terrorists, but the media and British politicians have called it an act of terrorism (hence the quotation marks). I still think their motivation was a little more complex and did involve their view that it was retribution for British and US military activities.